This water treatment facility can produce 17,000 m³/d of drinking water. Treating groundwater often raises its own challenges. 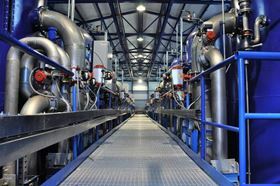 When the tender for a Serbian drinking water plant was won by Austrian water treatment specialist UNIHA, the main focus in the planning was the minimization of waste streams and the maximum water yield. Recovery maximisation in the treatment of water means the minimization of residual material flows and therefore the overall throughput. This leads to reduced energy and chemical requirements and to minimised waste disposal of the residual materials. This optimization is made possible by integrated chemical and physical processes combined with intelligent plant control. Due to the geogenic conditions, groundwater of many localities is turbid and it has increased concentrations of ammonium, iron, manganese and arsenic. In order to use this water as drinking water, it must be treated in suitable plants. This is also the case in a Serbian water treatment plant for the production of 17,000 m³/d drinking water. The Austrian water treatment specialist UNIHA Wassertechnologie GmbH in collaboration with the construction company PORR AG finished the plant in 2017. The scope of the contract included the planning, delivery and construction of the processing plant, as well as the integration into the existing infrastructure and the training and supervision of the operating staff. The main focus in the planning by UNIHA was the minimization of waste streams and a high partial load capacity due to the discrepancy between current water consumption and design capacity due to the long planning horizon. The raw water is extracted from groundwater wells and fed to the raw water tank of the plant. From there, the raw water pumping station feeds a two-stage filtration process: in the first filter stage, the raw water is aerated and filtered in a biologically active sand bed. In this way, turbidity and ammonium, iron and arsenic are deposited. The second filtration stage separates manganese by adsorption on manganese dioxide. The filtrate is disinfected with chlorine gas and fed into the drinking water network by means of a pressure booster. The two filter stages must be regularly cleaned from deposited material by backwashing with water and air. The resulting wastewater is collected in settling tanks and their clear phase fed to a separate treatment section. This treatment section consists of coagulation/flocculation, sedimentation, multi-media filtration and UV disinfection. The product has drinking water quality and is added to the product of the main treatment line. This setup leads to a total plant yield of 99.5%. The sludge from the settling tanks and from the sedimentation in the backwash water treatment section is fed to a sludge thickening and dewatering plant. The end products to be disposed of are thick sludge with> 20w% solids content and a small residual amount of wastewater. In order to optimally control the complex overall process with variable loads, the system is equipped with a fully automatic control system and the associated control elements. All process parameters are recorded online and flow with the data from the in-house laboratory into quality assurance and minimization of energy and chemical requirements. A new groundwater treatment plant in Cheyenne, Wyoming, is using air stripping to remove tricholorethene (TCE) from water supplies.